Hi everyone!! My name is Cindi and I live in Northwest New Jersey. 2015 Grow Your Blog party!! I feel it is a way for me to connect with people all over the world that otherwise I would never meet. The potential to learn something new through this opportunity is one in a million. At a very young age, I realized the thrill I experienced when creating. At 10 yrs I was introduced to a sewing machine and fell in love. In Junior High School while the others were struggling with a simple apron, I was tackling a lined vest and skirt. I am the happiest sitting at my machine, which sets in my grandmothers treadle cabinet. I am fortunate that I work out of my house and sell online what I create. Here is a sample of what I have made. I belong to an Etsy team called Folkart and Primitives, which covers a broad spectrum of art. I am offering a GIVEAWAY for the Blog Party ! 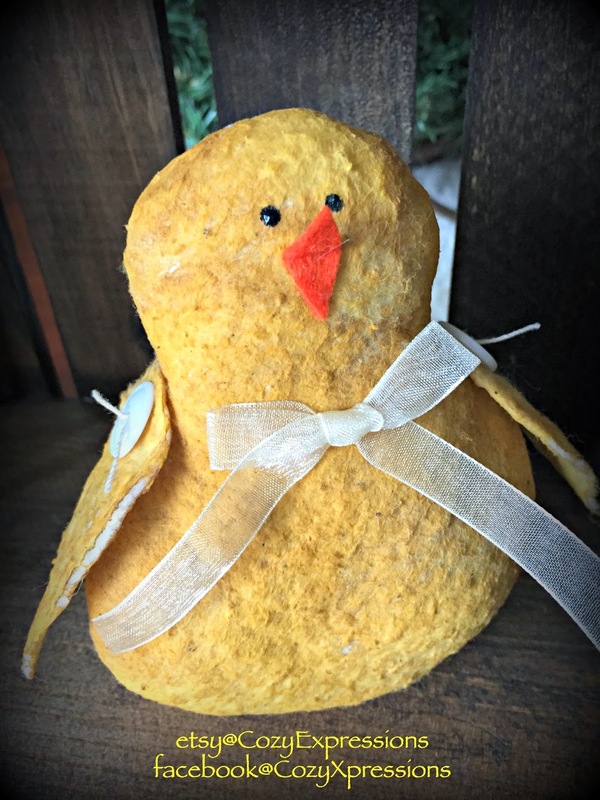 This little prim Peep is made from Warm n Natural, stuffed and nicely weighted. He was then painted, stained and baked. Is he not the cutest? Cute lil' peep! I'm a follower and wish you great success with your creations and blog. Your prim Peep is adorable. I'm a follower. Lots of luck with 'growing your blog'. Thank you for following Kate! I am already a follower of your blog. the blogging community is amazing-I have been inspired so much for my own creativity from meeting people everywhere. Love your little peep-too cute. Thank you for participating gpc. Yes, I love being at home. ! I'm a big fan of primitive art and admire your work. Usually you don't see spring items in this genre! I would love to be included in your give away for the cute little chick! ooops! forgot to say I'm following by email! Waving HI at you J......thank you so much for your kind words. I am also a new follower to you. Wishing you the best!!!! Cute blog. I'm happy to now be following! That little Peep is adorable. He caught my eye right away! Hi Jessica!! I LOVE your work and am following you. Good luck in the giveaway!! Hi Cindi, so glad you stopped by my blog and left a sweet comment. Love your cute little peep. I am following you back. So nice to meet you and find your blog! I love you work and enjoyed perusing your Etsy shop too. Thank you for taking part in this year's Grow Your Blog event! I enjoyed reading about you and your blog :). I would like to wish you every success in your blogging adventure. If you'd like to visit me back and find out more about my blog Under a Creative Spell, that would be fab! Thank you Asia King!! I appreciate you stopping in and I will be heading over to your blog! Ohhhhhhhhh - I just love stuffed animals and your Peep is darling. Isn't this party fun? 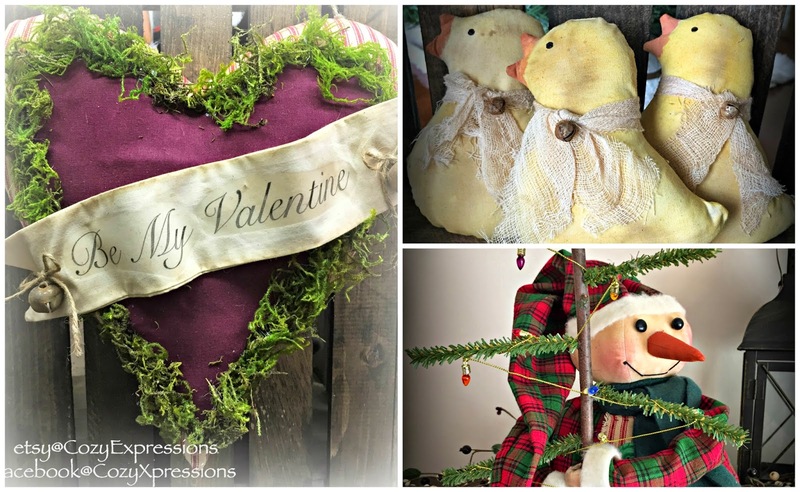 I've become a Follower and would love for you to do the same when you get to SuZeQ Creations. Hi Janice.....thank you so much for stopping by. I will definitely stop in to visit you. Hi Cindee I started sewing when i was ten(55 years of sewing now) and my grandmother taught me on her treadle machine. I still have it. I loe your folkart and prim style and your creations are very nice. Thank you for visiting me today and I am a happy new follower. Hello! I saw you on my blog, http://www.asymphonyofstitches.blogspot.com/ so I had to come check yours out as well! I love your wonderful creations and I'd love to be entered in the little chick drawing! Your things are so lovely and so is your blog! I'm a new follower! Enjoyed visiting your blog! The chick is adorable! I'm following and will return for future visits. Lucky you to have your grandmothers treadle cabinet! One of my fondest memories is as a little girl sitting at my grandmothers feet pushing the treadle while she sewed. Thank you for inviting us to visit your blog! Loved visiting your blog . I have my grandmothers treadle machine too and just had it rebuilt last year so it's in tip top order. It's still at my sisters house because she lives by the person who worked on it. (Out of State) I can't wait to get it back and sew on it again. Oh Carol, I would love to see a picture of it when you can. Unfortunately through a divorce, I lost the sewing machine itself, but I have the complete cabinet and all the iron that went with it. I love primitive ,My house is all vintage things. Hope you stop by . Hi Laura, thank you so much for returning the visit!! Wishing you the best!!! BTW I LOVE watercolors :) My favorite artist is Fred Bees.....a local artist that painted quite a bit of Bethlehem PA historic sites. I adore your peep and am with FAAP also. I am now a followers and love your makings , your Etsy shop is full of Fabulous! Your creations are lovely! I will be following your blog and the folk art and primitives blog on Bloglovin'. Thank you Renee for your wonderful kind words!! Hi Cindi, thanks for joining in with my Grow Your Blog party and visiting my blog. I love prim makings, and yours are gorgeous. isn't GYB wonderful to give us a chance to meet all sorts of talented and creative people. Good luck. I adore prim pieces and yours are so lovely! Thank you for your sweet words, liniecat and thank you for following!! LOL Carole, so you do your own thing? I am sure you know by now, there are times the "proper" way just doesnt work. Thank you for stopping by !!! Popping in from GYB. Your peeps are so sweet! You've done a highlight in the past post from Bethlehem. I live in a small Moravian community here in Ohio, which was the first settlement in the state, and had the first birth of a white child. First time I've seen pictures of Bethlehem. Thank you. Thank YOU Julie for stopping by! Bethlehem is a quaint town and beautiful during the holidays. It is also home to Moravian College and Lehigh University. During the summer they host a 10 day free music festival called Musikfest......check it out online. ! GYB is an awesome way to meet people!! I was just coming by to thank you for the visit. What sweet creations that you make and how special that you can work at your Grandmother's treadle. I've never heard of the baking part of your craft. I have always liked the Prim style. I hope you gain many new followers! Hi Tamara! Thank you for stopping in and commenting! Baking or letting your primmed piece dry in the sun will give you 2 different looks in the end. Its amazing. Hi, thanks for popping by my blog :) I'm looking forward to seeing all your creations! Your little prim Peep is so cute! Enjoyed visiting your blog! Hi Cindy!! All that liking is greatly appreciated. Thank you for following!!! My son loves your peep! What fun creations! Your blog is such a lovely place! I'm a new follower and so happy I stopped by! It is so nice to meet you AutumnWind. I thank you for your kind words and for stopping by!! Thank you so much Arianna ! !